Lysol Toilet Bowl Power Cleaner is Powerful! I have sampled and used the Lysol Disenfectant Toilet Power Bowl Cleaner and was fully satisfied with how well it cleaned the toilet bowl. It was easy to use and the angled spout allowed me to get the cleaner/disenfectant under the r of the toilet bowl. Smells clean and fresh and easy enough for anyone to use. 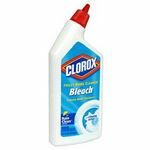 Beats Clorox TB Cleaner by a million miles! Clorox TB cleaner is the pits. I have hard water in my town & nothing does a better job than this in my home & Hubby's business. Thanks for as great product to keep my home clean! Too good to be true....but it is! I love this stuff. It's all I use now. I used to try to save money and buy the super cheap toilet bowl cleaner, but in the end, I realized that even though I was getting it for super cheap, I wasn't saving money in the long run. With the cheap stuff, I would have to clean my toilet a lot. Using this, it works wonders....I don't even really have to scrub anymore, and it smells nice and fresh for a lot longer. 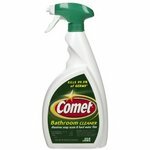 I clean my toilet every week with this stuff (with an older toilet, it's almost inevitable). This stuff cleans very well! The liquid is thick enough that it coats the toilet bowl, but not thick enough that that it gets stuck under the rim. The nozzle and angled neck of the bottle also allows you to get right under the rim of the toilet bowl without any hassle. This toilet bowl cleaner smells really fresh and definitely gets the job done. When I first moved into my apartment, the toilet was absolutely disgusting. As soon as I used this stuff for the first time at that house, my toilet looked brand new all over again. I'm definitely sticking with Lysol for many years to come. I even use their brand of toilet brush! The two products work very well together. I cannot say enough nice things about the Lysol line of products. From their use of hydrogen peroxide to easy to use dispensers, I have found a line of "helpers" in my home to include my bathroom. The entire line of cleaners from Lysol gives the satisfaction that it's truly CLEAN and, with children, pets and visitors, that is extremely important to me. I'm glad I use these products and will continue to do so for years to come. Performance When I use this product, I love how it sticks to the bowl giving me the assurance that I covered all areas. When I clean with the scrubber, I feel like I got all the issues in my toilet leaving me feel satisfied that it's DONE! It's a great knowing that it's clean and sanitized. Scent I can say that I do like the scent but that's not the most important feature of any product with regards to cleaners of the toilet. Let's face it, once the toilet is flushed a few times, the scent is gone. This is my favorite brand of toilet bowl cleaner. I have used Lysol Disinfectant Toilet Bowl Cleaner for quite some time, now. I like this product because of it's effectiveness and the clean smell it leaves in the bathroom. Also, the consistency or thickness of Lysol Toilet Bowl Cleaner is wonderful. It clings to side and under the rim of the toilet bowl and helps softens grime that may have collected under the bowl. Also, enabling me to clean my bowl without a lot of extra brushing. It works a lot better than some of the watery toilet bowl cleaners that just run down in the tank never clinging. The smell is fantastic, not to strong or harsh. The price is fantastic for Lysol Toilet Bowl Cleaner. Also, the way the neck of the bottle is made makes it easier to dispense the cleaner inside the bowl under the rim more effectively. Performance It clings to the sides and under the bowl to help make cleaning easier. Scent I love the smell of the Lysol Cleaner in the blue and white bottle as well as in the green and white bottle. 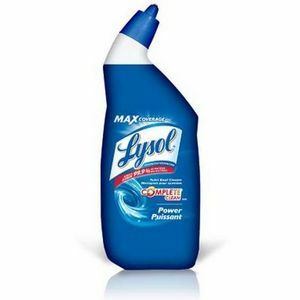 Lysol Disinfectant Toilet Power Bowl Cleaner is my all time favorite toilet bowl cleaner. I only need to use it once every other week as it does a great job at making sure I do not get a ring around my toilet bowl. You can smell the bleach scent. It leaves you feeling like your toilet bowl is sparkling! 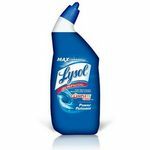 Performance This Lysol Toilet Bowl cleaner is awesome at not only cleaning and disinfecting your toilet bowl, but I also use it to help with hard to clean areas (i.e. grout). It is so powerful it helps you clean with minimal effort and who doesn't like to clean with minimal effort. I purchase it often and use it regularly. Scent This toilet bowl cleaner has a very strong bleach scent. Because of what goes into a toilet, I like the fact that the you can smell the clean scent coming from the toilet. I've been using it for years so I look forward to clean smell of bleach when I use the product. Makes me feel like the toilet is clean! 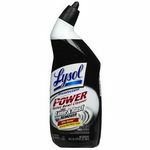 Lysol Disinfectant Toilet Power Bowl Cleaner is a great toilet cleaner. It works very well, even on toilets that get a lot of use. It also isn't too expensive, and a little goes a long way, so it's good value for money. Performance This is my favorite toilet bowl cleaner. The bottle makes it easy to get the product right where you want it, and the cleaner is thick enough that it doesn't just run down the bowl without actually cleaning anything. I usually put a good amount around the top of the bowl and then leave it for a few minutes, and when I come back it's ready to be brushed out. I rarely have to scrub or do anything more than a few swipes with the brush. Lysol is a great product for disinfecting as well. I'm not really a big fan of disinfectants in general, but I do like to use one to clean the toilet. Scent The scent of this product is great, mostly because it isn't a "fume" smell like a lot of these products. It's a clean scent, but it doesn't really stick around once you flush it. 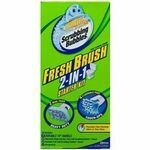 This is a great product that gets the toilet bowl very clean and smelling fresh. It works way better than others I have tried and you don't have to do tons of scrubbing, unless that is that you don't clean very often, then you might have to scrub a bit. It is easy to use either way. Performance I love this product because it works! I have tried many others and they do not clean like Lysol Toilet Bowl cleaner. Even after cleaning, this lasts a decent amount of time before I have to clean again. I definitely will keep using this product and recommend it. The top is a type of cap that you unscrew just a bit and you just squirt it around the rim of the toilet. Very easy to use and after your done just screw the cap back on so it doesn't leak out. Scent I like the clean scent, but would be interested in them coming up with other scents that do the same job. Lemon would be nice or Vanilla. It does leave a clean scent after use. Lysol toilet bowl cleaner delivers on its promise and does a great job at cleaning the toilet. I tried to switch to a less expensive brand but I noticed it wasn't as thick and didn't do as good of a job at cleaning the sides of the bowl. The Lysol brand has a thick liquid that sticks to the side of the bowl so it can stay there longer. It slowly runs down as to give it time to clean the sides. I also like that the container is well made and I've never had dripping issues after I lift it up to close it. I also don't have to worry about liquid coming out from underneath the cap like I did with cheaper brands. The cap continues to work well even until the end of the bottle. You only need to use a small amount of liquid for it to work well and let it sit for around thirty minutes so it can disinfect the bowl. Scent The cleaner has a very pleasant scent that isn't too overpowering but it still leaves a clean smell to your bathroom.